“Isn’t this the best flight ever?” an adorable, six-year old with pig tails asks me. I smile in agreement. The little girl is here with her family and brother from the Inland Empire, which is an hour east of Los Angeles, and the flight she is referring to isn’t really a flight at all. The plane engine is on, the take- off is announced and the safety drill is rehearsed, all while staying on the ground. The kids on board don’t even seem to notice, as they are busy checking out the leather seats, playing with the light button overhead, or watching SpongeBob on the personal screen in front of them. So what’s going on? You may ask. This trailblazing program was started three years ago in Boston, Massachusetts, after a parent of a child with autism needed to return home from the airport, but her son with autism refused to board their flight to Florida. She contacted the airline with her story and requested a program acclimating children with autism to airports and aircrafts. The program, “Wings for Autism”, was launched in cooperation with The Charles River Center and TSA in Boston, and became an instant favorite with parents of children with autism. It has since been adopted by several other airports across the United States. The program has been a success in many ways – training the staff to understand kids with autism and help them better, helping the kids to prepare for the airport environment and procedures, and alleviating parents’ concerns about traveling with their kids. Today, the program is launching in Southern California at the Bob Hope Airport in Burbank. This airport is a great choice as it is smaller, more compact, and easily navigable for special needs travelers. The simulation program allows parents to arrive at JetBlue’s terminal A, check in to the flight, and get their appropriate boarding passes. The families are then guided to the TSA check point for the customary identification and security measures. Since the demo is conducted on a Saturday afternoon, the check points are not crowded, which is nice. The parents are instructed to put their belongings in the designated bins, including electronics, jackets, and shoes, before proceeding through the screening machine. At of the time of this article, children under 12 are not required to remove their shoes. Our nest stop is the departure gate, which looks exceptionally festive and welcoming for today’s event. 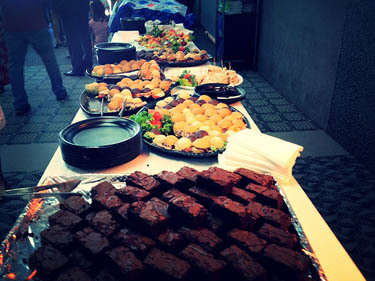 The airline and airport staff set up a table with an assortment of mini sandwiches, a delicious fruit salad platter, and a tray of freshly cooked brownies. In a corner, water bottles as well as additional snacks, including gluten free potato chips, are waiting. This is a great opportunity for the families to meet the volunteer JetBlue crew that is hosting this event, as well as connect with other families with kids on the autism spectrum from around Southern California. As the flight boarding is announced, a quick glance around the gate reveals that most of the parents came prepared with electronic devices to occupy the kids while waiting. 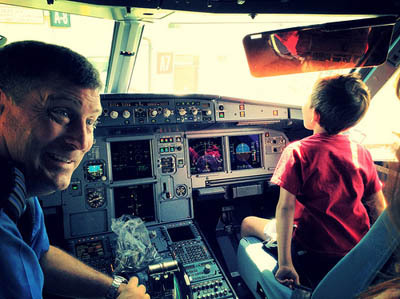 Once everyone is onboard, with the engine running to get the kids accustomed to the noise and to keep the cabin cool, the crew announced that they are preparing for takeoff and begins the mandatory safety drill. The kids get one last chance to familiarize themselves with the aircraft interior (including the bathrooms) for a few moments before they have to deplane. On the way back out there was a special surprise – you can actually visit the cockpit and chat with the pilot! Back at the terminal, the kids get a souvenir backpack filled with goodies and a commemorative T –shirt. 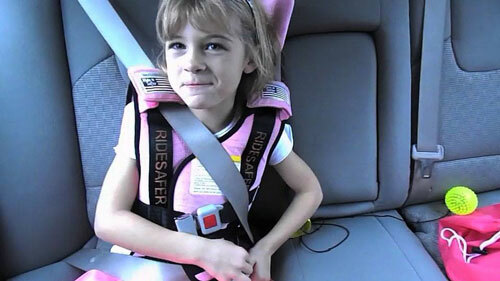 Many of the newly acquainted parents exchanged phone and email information, while commenting how this experience has already helped their kids learn how to cope with the stress of traveling better. 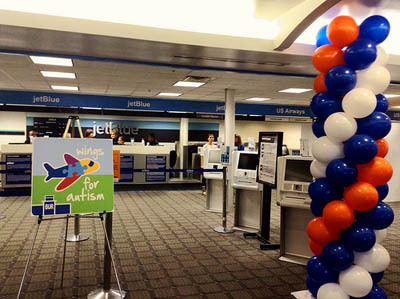 Like one observant child pointed out – blue is the color of JetBlue’s logo, as well as Autism Awareness Day. Is it a strange coincidence ? Maybe not. Have you participated in the Wings for Autism program with your child? What did you think? I’m glad you found the program useful,Melissa.The program is a great tool for parents to assess whether their kids are ready for air travel. We are planning to travel to Cancun on Labor Day weekend 2013 with my nephew who has Asperger syndrome. This will be his first time to fly. We are based in White Plains, New York but the Wings for Autism in JFK Airport – New York will not happen until fall. Do you have any suggestions or do you know of any Wings for Autism events that will be happening in Boston, Philadelphia or anywhere close to New York that is drivable just so we can do a dry run with my nephew? Your assistance will be greatly appreciated. Pls. Let me know when is d incoming event”WINGS 4 AUTISM” n Burbank Airport CA? How to register to be in d list? Who’s d contact person? Thank u n appreciated. Will there be a wings for autism event in San Francisco? I know of a family that will be traveling around October 2016 and would like to have a dry run with their child.